To have a successful business, you need one single, most crucial thing. Without it, you have no business. James Schramko shares the highlights of his recent SuperFastBusiness live training on this very important topic. 00:25 – Are you planting seeds? 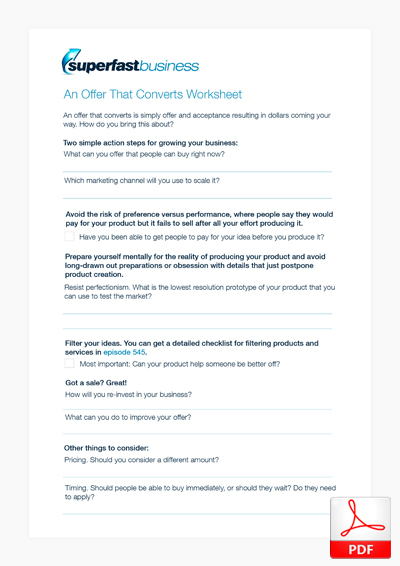 04:19 – What is an offer that converts? 13:17 – Would you like to buy something else? James Schramko here, and welcome to SuperFastBusiness.com. In today’s episode, I want to cover a topic that is perhaps the single, most important thing for you to have if you would like to have a successful business. Without this, you will not have a successful business. It would be like a farmer expecting to harvest a crop but never planting seeds. What am I talking about? I’m talking about having an offer that converts. I recently ran a training inside SuperFastBusiness membership, which is a private members-only access, where I personally coach businesses, and it was called Your Offer that Converts. I ran this training in October 2017. It has had incredible feedback, and it resonates with members. This is because without this offer that converts, you just don’t get anywhere. So I’ve had people say to me, “This is fantastic training.” “Simple and brilliant.” “Excellent training.” “Especially direct.” “Keep it simple.” There’s some great takeaways from members that they’re going to stop underselling themselves. They’re going to convert customers when they’re not even online and that they’re also going to focus on things that they might have forgotten about, which is great. Some people have just realized that after 15 years, they haven’t got this right. But the training connected some dots. So I just want to give a highlight of the training. Of course it’s not the comprehensive training that went for a substantial amount of time inside the community, like 80 minutes or so. But this is just a little overview because I think it’s an important enough topic that I’d like to direct people here if they’ve ever asked me about it. So let’s talk about your offer that converts. Certainly for me, it was the keystone that unlocked my entire online business because when I started my online business, I still had a job, as I imagine many people listening to this podcast would. I was trying to do this online business between 9:30 at night and three in the morning while I still had a normal job. But it was very frustrating. I didn’t really have a budget for it. I didn’t even know what I wanted to do. I just knew that I needed my own business and I figured that building a website would be a pathway to that. But until I was selling anything, then, I had a problem because there was no cash flow coming into this business. It was just really running on whatever time I could put towards it, which is slow. So we’re talking about back in 2005 and 2006. It was slow going. 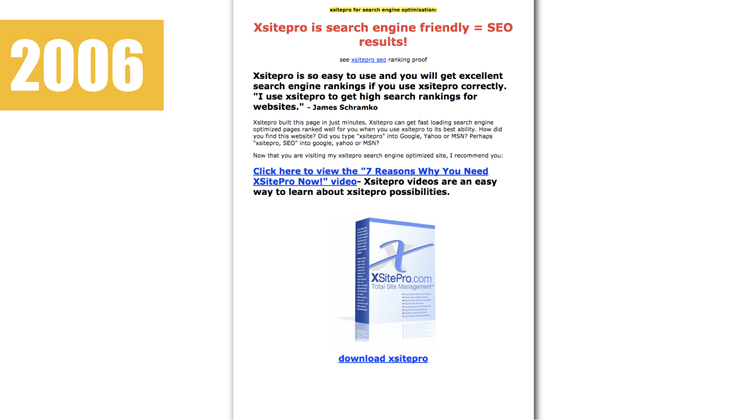 As you probably heard before, I stumbled across some software that helped me learn how to build websites and then build this website and publish it, and eventually I became an affiliate for that and over several years, I went from my first sale of $49.25 through to where I got that product up to about $10,000 a month, and I was quite dominant in the online space. So there’s really only two simple steps. One is offer something people can buy right now. That’s the simple step number one. And step number two is once you’ve done that, scale it. That’s a business. If you think about any business that you’re dealing with, at some point, they made their first sale and then they got better and better at it. Maybe they started somewhere and didn’t end up there. Maybe they had a lot of different products. But the reality is they made a sale, they reinvested some of that back into the business and grew it, and there you have a business. So some businesses have grown phenomenally off even just one product. I remember at one point, Apple I think only had four products when Steve Jobs renovated it after he came back after being fired from it. So you don’t need many offers that convert. You just need something hot. What is an offer that converts? 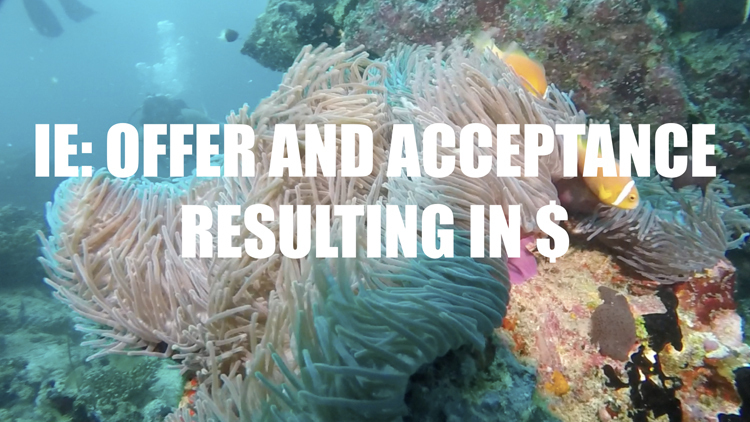 It’s simply offer and acceptance resulting in dollars coming your way. So a lot of people spend so much time mucking around with ideas and entertaining themselves and all their friends with these wonderful ideas about what they’re going to do, but they never actually implement them. Even worse, sometimes people give them good feedback, ‘Oh yeah, that sounds great. I’d buy that.’ And then they go away and get lost in a rabbit hole of research and building things, looking at fonts and colors, and getting designers and business cards, and finally they build this thing, and sometimes spending tens of thousands of dollars or hundreds of thousands I’ve heard of, building software applications, and getting up the website, and buying up domains, and forming an entity, going into partnerships. All these and then nobody buys. There’s crickets. 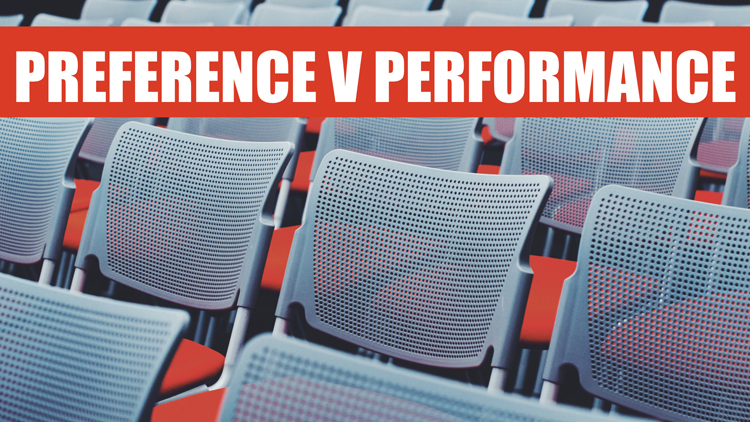 This is the situation of preference versus performance, which can be devastating. I’ve built plenty of things that no one bought because I didn’t learn this lesson straight away. Eventually, I learned that if someone says, “Yeah, I’d buy that,” my next question is, “Will that be PayPal or would you like to use a credit card?” I will get the payment to validate it. You can do this with events. You can sell an event first and then run the event. You can do it with information products. You can collect the money and then deliver the product. You must deliver though. Make sure you actually deliver. You’ve got to be careful with that. The other thing is, maybe we’re not mentally prepared to be successful yet, so we’ll just sabotage ourselves by continuing to perpetuate that dream, and we don’t do the steps that will bring us closer to success. So if I were to say that it is as simple as coming up with an offer that converts, as finding something that people will give you money for, I know people who can do that within a day. They can go to the market, test an offer, and have someone say yes and then deliver the services. They can get to that point within one day. Most things beyond a day or two are starting to border on this self-sabotage or delaying because it’s just going to be more entertaining or interesting to you than the boredom of actually creating a product. Then there’s of course the perfectionists who like to get everything just right before they move ahead. And there’s no shortage of ideas. Ideas come along all the time. Now in the training inside SuperFastBusiness, I talk a lot about design and prototyping and idea formation and how to go out to the market with low-resolution offers and low tech. But it can be simple as a face-to-face conversation. That’s how you can test ideas. 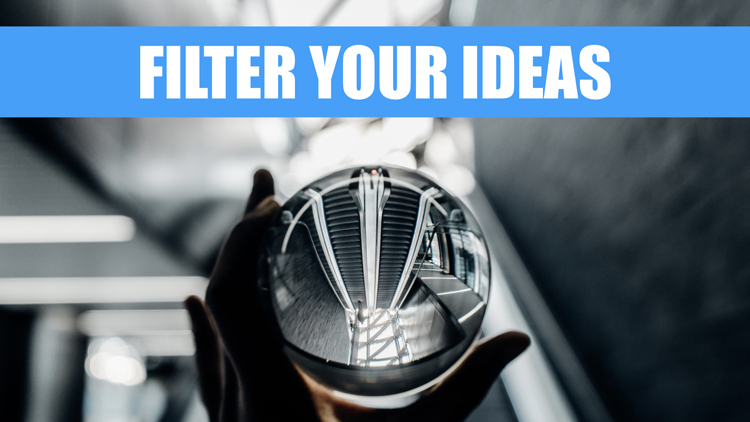 You can filter your ideas using some of the tools that I’ve discussed on previous podcast episodes. One of those episodes was called episode 545 – Which Product or Service Should You Focus On? That might help you figure out which area you should delve into first. Now there are some effective filters that you can use that are covered in that episode. There’s also other things you can do, like just bypass these complex, complicated funnels. So there’s a lot of software out there and a lot of marketers tricking you into thinking that you need all these software, domain names, funnels, Facebook ads and all this stuff. It sounds pretty complicated and it is. It can get super overwhelming and really expensive, and you’ve got nothing to show for it. But what if you just went straight for the sale? What if you just put an order button? I actually did that once for my coaching program. I put a PayPal button on a page that said, “Work with James.” I explained in a few bullet points what you get and somebody clicked on that link and purchased. It was that straightforward, and then I went to Skype to deliver the program. You just don’t need a lot of infrastructure. In the training, I talked about a friend of mine who has no domain name, no name for the business, no business cards, no office. All she has is a Google form that people come to and fill out. If she’s interested in dealing with them, she will send them an email and if they buy then they’ll send her money and then she fulfills via email. It’s that simple. All the rest are just unnecessary delays into getting started. I’m talking about the minimum viable product here, like as in the Lean Startup. Once you get sales, then that’s the easy part. You start reinvesting and you drive your offer. I talked about the various places you can drive your offer from. Some of them produce me a huge income each year just from these interesting little places that I drive traffic from within my own ecosystem. I also revealed some of the products that I’m selling and how lucrative they can be. And also, there’s really only one filter that you should be looking for when it comes to your offer that converts. And that is, how can you help someone be better off? How can you create a product or a service or sell somebody else’s existing product or service as an affiliate, which means you get paid a commission, simply for helping them be better off. There’s also a few ways that you can price products. So I talked about pricing strategies and there were four main pricing strategies that I talked about and then I went into detail about if you should go private or behind an application process. Also there’s things like timing. When should you let people buy a product? Right now or should they wait? Should they apply? Then I talked about what you’d be looking for in a market. But here are some other things that I’d be looking for in a market. I’d like to see other people already selling a product or a service that I’m looking to sell. If no one else is doing it, that’s a big alarm bell. I like to see that I can reach my market. For most markets, Facebook would tick that box. And then you have to go further into the sales copy side of things. So I gave a fairly comprehensive checklist. Some of the things that you’ll definitely want are: who is your customer, how do you get their attention, what problem are they having, what would happen if they don’t get the solution that you’re selling, and what is the internal and external enemy, like what are they fighting against in their mind, and who’s the competitor that you can help them beat? So for example, if someone had a job and your product helped them get out of a job, then the enemy might be the boss. And then what result will people get? Forget about dumping all these features. Talk to them about the results they’ll get. Rather than getting ABS brakes, maybe, you talk to them about how ABS helps you steer whilst you’re heavily breaking, so that you can avoid being in an accident. That’s the result that someone would get. There are a few other copywriting things, and I don’t want to do my friendly copywriting friends a disservice by trying to gloss over those. I put a fair bit of attention into that. But one thing we also know for sure that people love is stories. I’ve covered all sorts of storytelling blog posts. You can go and listen to that podcast if you want. I’ve spoken to Clint Paddison about storytelling. I’ve spoken to a story brand CEO about selling. So have a look for episode 477, if you like. And also, have a listen to episode 528, which talks about story. So these are great resources for you to have a look at. The other thing with your offer is you’ve got to be very clear on who you are, and why you’re qualified to sell this thing, and how much the offer is, and what people should do next, like what do you want them to do when they’re there at your offer, even if it’s face-to-face, how do they move forward, what forms do they fill out, what can they expect when they order. Then what sort of support do you have, and how do you remove some kind of risk? Jay Abraham talks about risk reversal. This is where you might offer a guarantee or show them some proof that it’s worked for other people. You could name drop a few celebrities if you’re in the US market. That seems to work quite well. And perhaps there’s a bonus that people could have if they place the order. And maybe there’s a deadline they could order right now instead of waiting. Of course, you want to do anything that builds trust and desire for your customer when you’re making this offer. If you can do all of this, then you’re going to scale big. In this training inside SuperFastBusiness, I talked about some of my most successful students and what they did once they had an offer that converts that enabled them to have stratospheric growth. One of them, for example, went from around six million dollars a year to $26 million dollars a year using one of the strategies that I talked about. There are other things you can do too, like when someone buys something, you could ask them if they’d like to buy something else. That’s called a cart bump. We use ThriveCart, which allows you to do that very easily by just ticking a box. Of course my OwnTheRacecourse strategy is a preeminent content marketing idea that allows you to build an asset and reach customers and previous customers. So I would strongly recommend that you go back and listen to episode 546 – OwnTheRacecourse 2017. You could have a listen to the case study of Kevin Rogers at episode 547, and also the case study of Clint Paddison at episode 549. These are just fantastic case studies that will help you understand how OwnTheRacecourse works and inspire you to get started. There are a few other tips. I talked about continuity and how it’s so much easier to make a repeat sale when people agree to the rebill upfront and how you might go about that. I’ve done complete and comprehensive training inside SuperFastBusiness membership on both how to setup a recurring business but also how to sell recurring business subscriptions on autopilot, which I think is worth the price of admission. And of course, there’s a few other things you can do to really boost your offer that converts. You can do things like have a survey or a quiz. And I shared in that training one of the sites that I’ve been doing this with, and it’s working really well. And of course, if you’re getting an offer that converts then keep this in mind: 10 percent of your customers will pay 10 times more. I call this 10 percent 10 X. 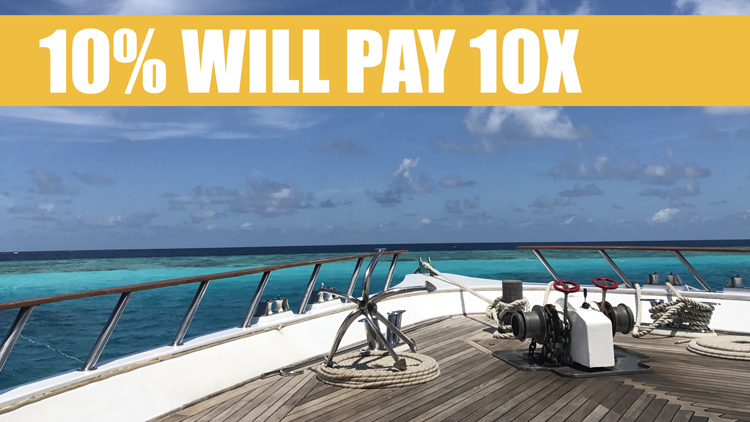 10 percent of your customers will pay 10 times more. So see if you can put a zero behind your current best offer and then market that to your existing customers, and I’m sure you’ll find that 10 percent of them will most likely buy if you’ve constructed the offer very well. So what this means in simple terms, if you already have something that’s selling, if you’re listening to this and you’ve got a product, then right now, you probably have the opportunity to significantly increase your business just by doing that one technique. So there were a few more tips there and I answered a bunch of questions. But I just wanted to give an overview of your offer that converts because I think this is a fundamental skill. Of course, I recommend you join SuperFastBusiness membership if you’re not already in there. I would be delighted to coach you with your offer that converts and to help you grow your business because I know how it’s done, having done it myself. If you’ve got any questions, certainly feel free to ask me below this post. This is episode 551 – Your Offer that Converts. It’s a very important episode. If you liked this episode, be sure to rate it at iTunes and perhaps share it with a friend who’s struggling online. If you could send them this episode and it helps them, then you’d be doing them a huge favor. I’m James Schramko. Thank you so much for listening.